We supply and install all types of gate openers for swinging and sliding gates. We cover everything in-house from quote to build and fabrication. We’ll even come to your property and recommend a solution to fit the layout of your site. Like domestic gates, our range covers auto-opening single and double swing gates, auto-sliding track gates and cantilever options for both if for whatever reason we can’t lay a track down. Our range of safety devices and alternative opening methods allows us to install on sloped surfaces as well as flat-level. 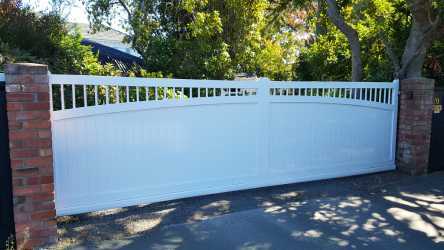 Unlike domestic gates, commercial gates tend to be bigger, heavier, have a much higher usage with more openings per day. Because of this, we supply bigger motors for the extra weight and take the higher usage into account when it comes to materials and engineering to prevent rapid wear on the gate. The need for higher security is a factor too. Our range of security materials include chain-link, mesh and barbed wire. If you require barrier arms, we can provide those for you. We partner with Certified and General Welding for our welding and engineering services to ensure our gates are strong, secure and the highest quality. We stand by the excellence of our work and keep up with the latest gate automation technology. We price ourselves rather competitively and won’t be beaten on any genuine local quote or price of comparable materials. For most commercial installments, you can expect an average quote of $8,000 – $30,000.